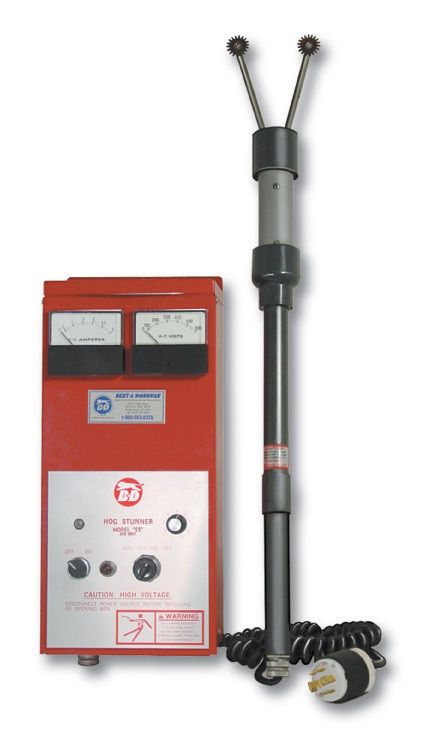 Equally well-suited for sheep, lamb and goats, the ESS Heavy Duty Hog Stunner features a heavy duty transformer, voltage and amperage meters, with a heavy duty on/off switch. It is capable of handling 300 hogs per hour. Specially designed for restrained hogs or free hogs in shackling area. Cuts operating costs, requires less electricity than a 50 watt lightbulb. Increases profits through greater yields. Meets all requirements for humane animal treatment. This is the pork industry's most widely used electric stunner. Features include a 6 volt waterproof control button that provides maximum operator protection; a heavy duty reinforced prod designed for increased durability; specially designed prongs for positive contact; a prod assembly weighing only 3 lbs(1.5 kilos)for easy handling and maneuverability. Prod length 33-3/4"(857.25mm). Available in AC-110 volt single phase 60 cycle or AC-220 volt single phase 50 cycle.